Infront of my toes lies the world Theatre Design. I was watching a lot of road movies, to get this particular feeling of a constant journey in the play. I was looking at motorways, buses, vehicles since there was a lot of those written in to the sript. When my son, perhaps inspired by this, wanted to build up his car track, the sollution for this playfull "roadplay" was clear for me. As in a roadmovie the actors move fast from scene to scene in an ever ongoing journey. I gave them a space that is the road they travel, an enlarged cartrack or a miniature motorway. It surrounds the audience and includes them in the action, they perform infront and around the audience. Every detail from the real world, such as their parents house, cars they meet, illustrated by remote controlled objects that travel around the car track. The reality they create is enhightened with oversized objects they bring on stage. 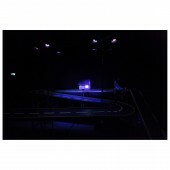 The car track surrounds the audience and includes them in the action, they travel and play infront and around the audience, remote controlled props travel around the audience. I started to work on the design in april 2012, I made about 20 different models of versions of the cartrack until I was both happy with the design aswell as it was makeable. 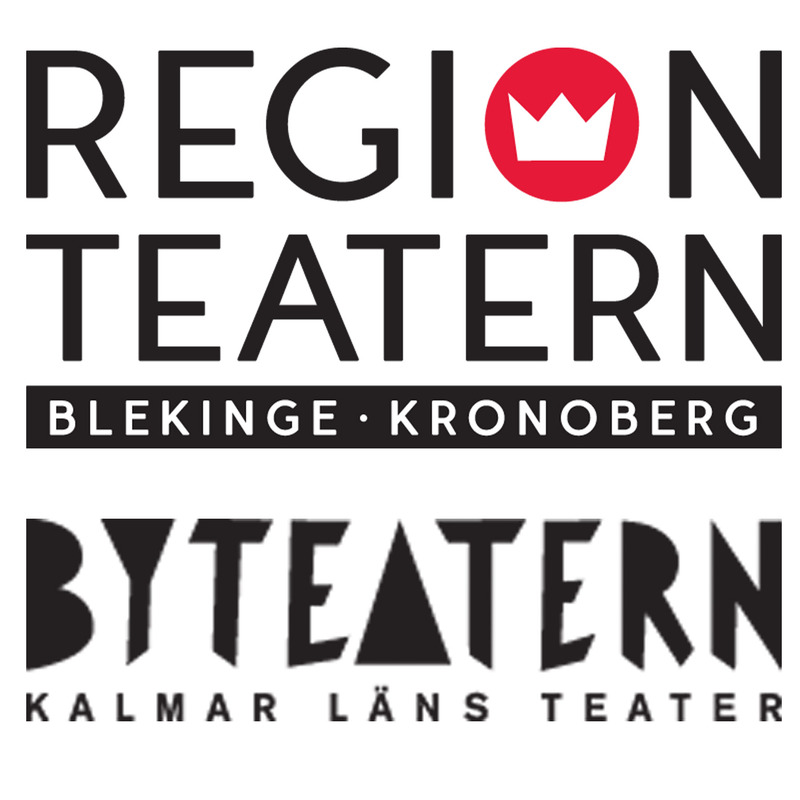 The set was built in the workshops of the theatre Regionteatern Blekinge Kronoberg in december 2012. The actors rehearsed in the set for 7 weeks until the opening of the play in february 2013. It is now touring across the country. This is a touring theatre piece, so it is built as a classical car track, with pieces put together. It has folded legs so that it becomes flat for transportation. The dimensions of the full space, including the audience, is Width 9000 mm and Depth 1300 mm. The car track is 850mm wide. To analyze the text and to find the very essence of it is the major part of my research as a theatre designer, and I find that part hard to pinpoint, as it is a journey in my head. The playful text and the authors and directors vision of a busride made me searching in the field of roadmovies and to look at motorways and vehicles. I had a long journey with many versions of for example the audience sitting in a bus, different versions of motorways until my sons cartrack was the simple research that led me to my final idea. It was a challenge that the script contained a bus, some cars as essential elements in the play, when I finally came up with the car track idea with remote controlled vehicles the sollution seemed easy. 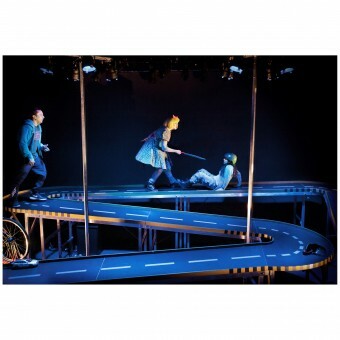 This is a touring play, so it had to be transportable and built within an hour. Johanna Mårtensson and Ida Lundén, 2012. 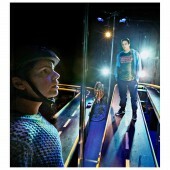 This play was commisioned as a coproduction between two major touring theatre institutions in Sweden. Infront of My Toes Lies The World Theatre Design. by Johanna Mårtensson and Ida Lundén is a Nominee in Performing Arts, Style and Scenery Design Category. · Click here to register today inorder to be able to view the profile and other works by Johanna Mårtensson and Ida Lundén when results are announced. Infront of My Toes Lies The World Theatre Design. by Johanna Mårtensson and Ida Lundén is Winner in Performing Arts, Style and Scenery Design Category, 2012 - 2013. · Press Members: Login or Register to request an exclusive interview with Johanna Mårtensson and Ida Lundén. · Click here to register inorder to view the profile and other works by Johanna Mårtensson and Ida Lundén. Did you like Johanna Mårtensson and Ida Lundén's Performing Art Design? Did you like Infront of My Toes Lies The World Theatre Design? Help us create a global awareness for good performing art design worldwide. Show your support for Johanna Mårtensson and Ida Lundén, the creator of great performing art design by gifting them a nomination ticket so that we could promote more of their great performing art designs.